I needed equipment for underwater shooting during my stay with Coral Cay Conservation in the Philippines so I carried out thorough research into the available options prior to the trip. The main considerations were cost, weight (airline baggage allowance of 20kg) and image quality. I have Canon Eos 350D and 5D Mark II cameras with 100mm f2.8 macro, 16-35mm L f2.8, 24-105mm L and 50mm f1.4 lenses and a 580 EX speedlite. 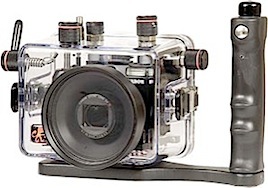 The Ikelite hard housing for the 5D Mark II is £1200 with around £300 extra for two different ports to fit different size lenses and a further £340 for an 8” dome port should I want to use a 15mm fisheye lens. A strobe light and fittings would add from about £460 upwards. The various options are shown below. The total cost for this kit would be at least £2300 with a weight of 4.2 kg. Perhaps I could go with a smaller camera and housing but it would mean purchasing a new camera and the kit to go with it. I considered the Canon Gl2. The housing comes standard with an optical grade glass flat port which allows full use of the camera’s zoom range without vignetting. A flash diffuser is included to improve image quality when using the camera’s built-in flash to illuminate the subject. Special conversion circuitry built in to the housing provides Canon ETTL exposure connected to any current model Ikelite DS Substrobe. 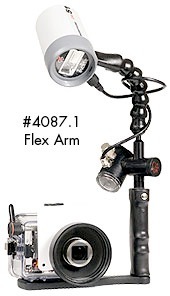 The camera controls the Substrobe’s output for accurate exposure. This option would be 1.5 kg lighter and cost up to £1300 less if the internal flash was used rather than an external strobe but I would need to add the cost of additional lenses. I would be able to shoot RAW. After hours and hours of research and head-scratching, I finally chose this, the flexible, Ewa Marine, waterproof bag, with which I could use the kit I already had. Not too expensive, not too heavy….and unfortunately, not too simple, as it turned out! 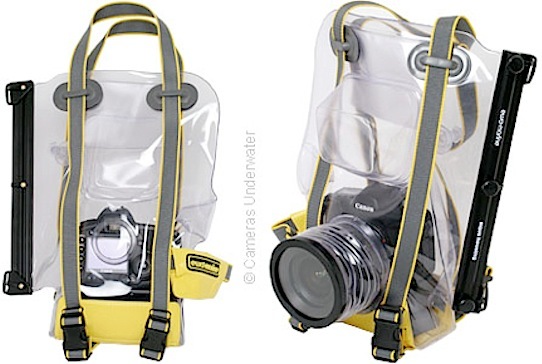 There are different versions of this bag, this is the most expensive one which I chose so I could use the 580ex speedlite and also my 16-35 mm lens. The U-BXP 100 is a special version of the U-BXP housing. It has a wider front glass and allows in combination with the C-A 77 adapter (supplied with the housing) and C-A 82 (available as an accessory from your dealer) adapter the use of lenses with a filter thread of 77 and 82mm. This means you can use your professional digital SLR camera like the Canon EOS 1D, 1Ds Series as wellas the Nikon D1, D2H, D2X, D200 and similar cameras, with most of the professional wideangle lenses currently on the market. This enables you to use wideangle lenses with a focal length of 16mm (full format chip) without problems. All lenses used with this housing must have a internal focus. 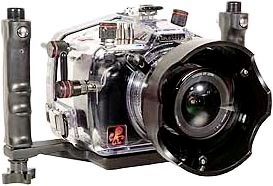 Lenses with a smaller filter diameter can also be used in this housing as long as they have internal focus. You just need the right step-up ring. The autofocus adapter (AV110) is not included in delivery as it is not needed for this housing. If the optional BF1 lead weight is inserted into the housing, underneath the camera, it becomes even easier to reach the maximum depth. Experienced photographers have confirmed, that the auto focus and flash both continue to function perfectly. As you descend, the air is pressed into the camera. Due to this, the pressure inside the housing willremain the same as the surrounding water pressure. The dive must be started with a suitable amount of air inside the housing. The bag is waterproof to over 30 metres – not a drop got through the seal and it enabled me to use the kit I had already. It is sturdy and seems hardwearing for a plastic bag but there were some problems and I found it frustrating to use. Not using a battery grip, I found the LCD screen of the Canon 5D Mark II did not line up with the viewing ‘circle.’ Crucially, the rigid seam of the bag lined up exactly where my finger needed to feel the shutter button so it was impossible to have much control. Successfully half- pressing the shutter for auto-focus or fully pressing to take the shot was rather hit-and-miss and I’m not sure I could have improved with practice. The design of the straps seems illogical – there doesn’t seem to be a way to use them to comfortably hold the bag in place, if dropped it could float away. I needed to attach different weights to the bag but it wasn’t possible to clip them in place. I had to laboriously undo each strap before threading the weights on. The other people I was diving with used underwater compacts and I would say they took far better shots than I did and they certainly enjoyed taking them more. I was taking part in coral reef conservation and was there primarily for that purpose so the opportunities for me to dive with thephotographic equipment I had were limited. Those with the compacts were able to take them on every dive. Next time…. 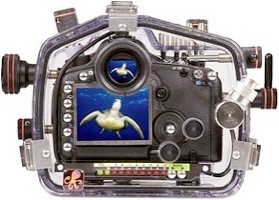 I found your blog looking for info on the Ewa-Marine underwater camera bags. I have also done tones of research and was leaning towards the bag, because of the cost reason. After reading your blog, I am not sure I should go for the bag option. The autofocus problem seems to be a big one. I want a bag or housing to do water action lifestyle shots like surfing, kaiaking, driving, cliff jumping, people running into the surf, etc. Could you please give me all the pros and cons you can think of when it comes to the bag option. And given the option to buy again, would you take the bag or a housing for the 5D II. I think the biggest problem for me was having the seam of the bag lined up over the shutter button which meant that I couldn’t feel the shutter button well enough to autofocus and take the shot at the precise moment that I wanted to. Autofocus does work but manually focusing, of course isn’t possible. Also, as I wasn’t using the camera with a battery grip, the circular ‘window’ on the rear of the bag, obscured a clear view of the LCD screen of the camera. Once the bag is sealed, you can’t change any of the settings or add or remove a speedlite until you open up the bag again. It felt a bit like performing a surgical operation wearing gardening gloves and I should imagine that if you intend doing fast-action type photography, you might find the clunkiness of this bag very frustrating and miss a lot of shots. The housing would be relatively easy to use but is expensive and perhaps is over-specified for your needs ie you don’t need the waterproofing needed for water at high pressure at depth. 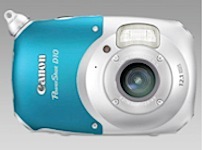 I would consider using either a good, waterproof compact like the Canon Powershot D10 – you’ll get plenty of decent shots with this without a lot of hassle or expense – or do a search to see if there is a waterproof, above the surface cover of some kind for the 5D II. New gear is coming on the market all the time and it’s two years since I did my research so there may be other things available now. My conclusion was, that unless you are doing a job which gives you lots of access and opportunities to photograph the submarine evnvironment so that you have plenty of time to practise, underwater photography adds a lot more technical difficulty and cost to the pursuit of fine images. I was in the Philippines to do coral reef conservation so I had few opportunities to dive with the bag whereas I would usually have been allowed to use a compact. So, I would have been better off with the D10 but if I had to choose between the bag and the housing, I’d go for the housing. The housing may also have more resale value than the bag. I hope this helps – let me know how you get on. Nice post. Getting into a similar situation for Curacao. I could see how the bag gets to be too much while diving and trying to multitask. Back to the drawing board. Thanks for the review. Glad you found my post useful, Chris. It wasn’t easy deciding what to take. I’m going diving in Cambodia and the Philippines again soon and am considering just taking a waterproof compact with me.